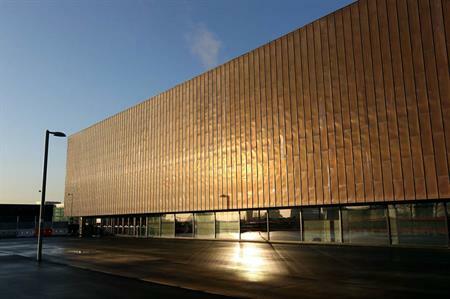 The Copper Box Arena became the first fully operational venue in London's Queen Elizabeth Olympic Park when it reopened on Saturday (27 July). The Copper Box Arena, also known as the Handball Arena during the London 2012 Olympics, reopened last weekend, becoming the third-largest venue in the capital for events. Located close to Hackney Wick station, the venue's main space is the 2,743m2 Sports Hall with a capacity of 6,000, which can be extended to 7,500 for larger events or reduced when appropriate. The venue hosted handball and modern pentathlon fencing during the Games and is ideal for concerts, exhibitions and conferences, as well as major sporting events. It will be home to the London Lions basketball team and will host some Great Britain matches. Other spaces in the Arena include the 184m2 Dance Studio and two multi-faith rooms, which can both be used for meetings. The first-floor concourse offers breakout space. The Queen Elizabeth Olympic Park also hosted last weekend's London Anniversary Games, which sponsor Sainsbury's used to foster team spirit among its staff.